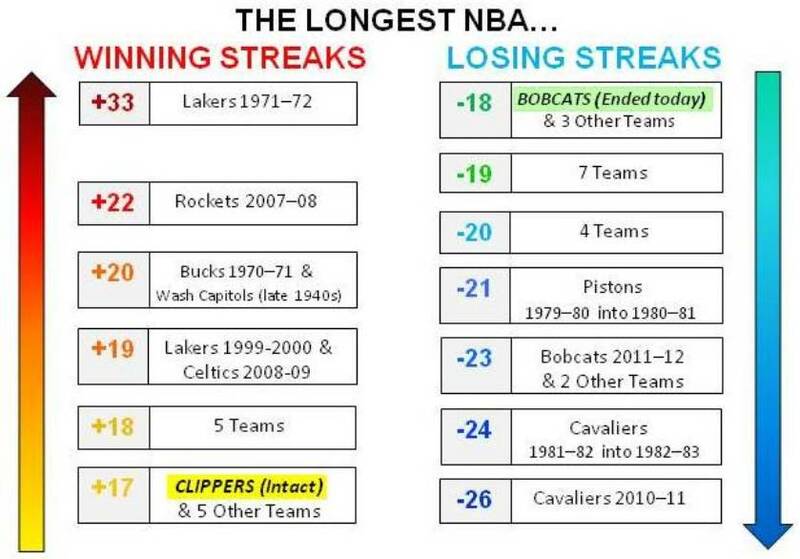 As of this morning, two long NBA streaks were ongoing, the L.A. Clippers' 17-game winning stretch and the Charlotte Bobcats' string of 18 consecutive losses. The Clippers are off until a Tuesday night game at Denver, whereas the Bobcats played this afternoon at Chicago. 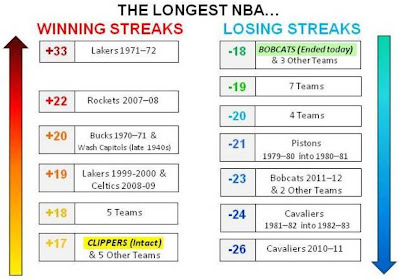 Thinking this morning that Charlotte's losing streak was likely to be extended in Chicago, I began work on the following chart to track how far the Clippers would rise in the annals of all-time NBA winning streaks and how far the Bobcats would fall in the ranks of all-time NBA losing streaks. You may click on the graphic to enlarge it. A funny thing happened at the United Center, however, as the Bobcats shocked the Bulls, 91-81, to bring the Charlotte losing streak to an end at 18. After the Bulls had rallied to tie the game 65-65 after three quarters, Chicago proceeded to miss its first six field-goal attempts of the fourth quarter as Charlotte took a 75-65 lead. The Bulls never seriously challenged thereafter. Tomorrow, the Clippers will have the opportunity to extend their streak. 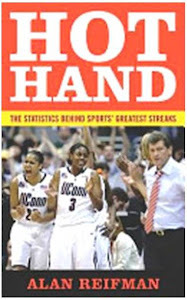 UPDATE 1/1/2013: The Clippers had their winning streak ended by Denver.